Oblique aerial view of the fish trap and bridges, looking W.
Publication drawing. Garron Bridge; mason's marks. 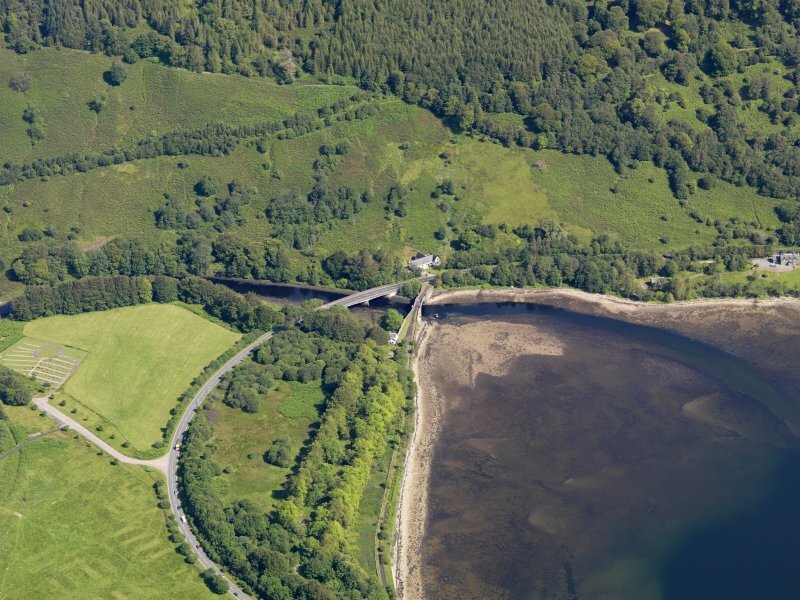 Oblique aerial view of the bridges, looking SW.
General oblique aerial view of Inveraray Castle New Bridge and Garron Bridge, taken from the WNW. General oblique aerial view of Inveraray Castle New Bridge and Garron Bridge, taken from the S.
Inveraray Castle, Garron Bridge. General view from South-East. Oblique aerial view of the fish trap and bridges, looking SE. 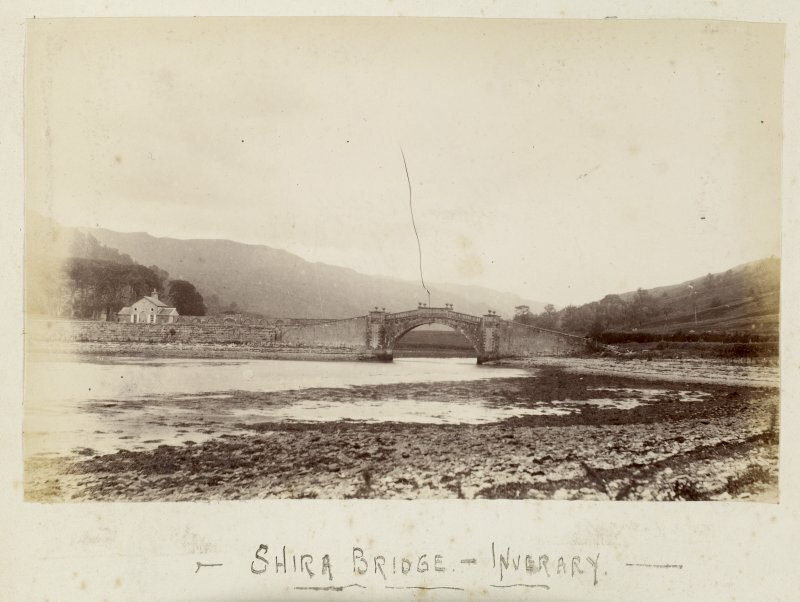 Inveraray, Garron bridge, Drochaid Gearr-abhainn. Survey drawing of South elevation and plan. 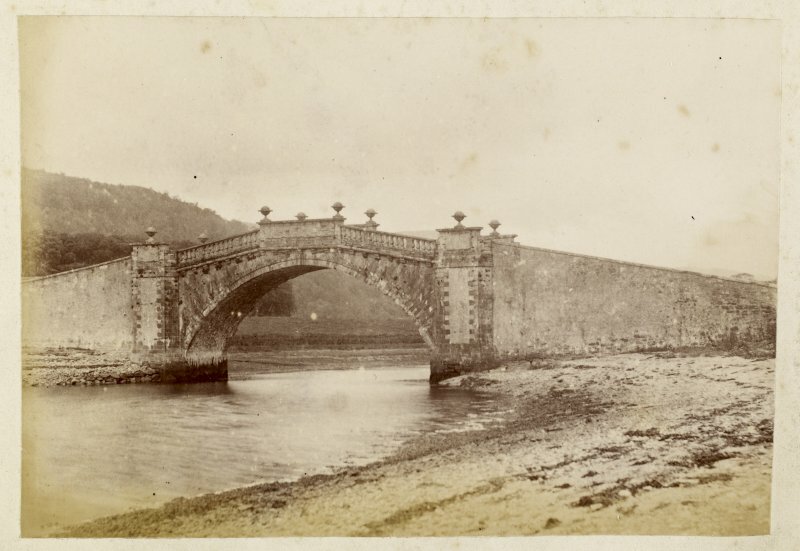 Insc: 'Toll Bridge, Inveraray' '(River Gearr Abhainn)'. See also NN11SW 14 (Military Road MR7). For successor and present bridge (NN 11424 10149), see NN11SW 25. Garron Lodge and screen wall by Robert Mylne, Architect, 1775-1776. 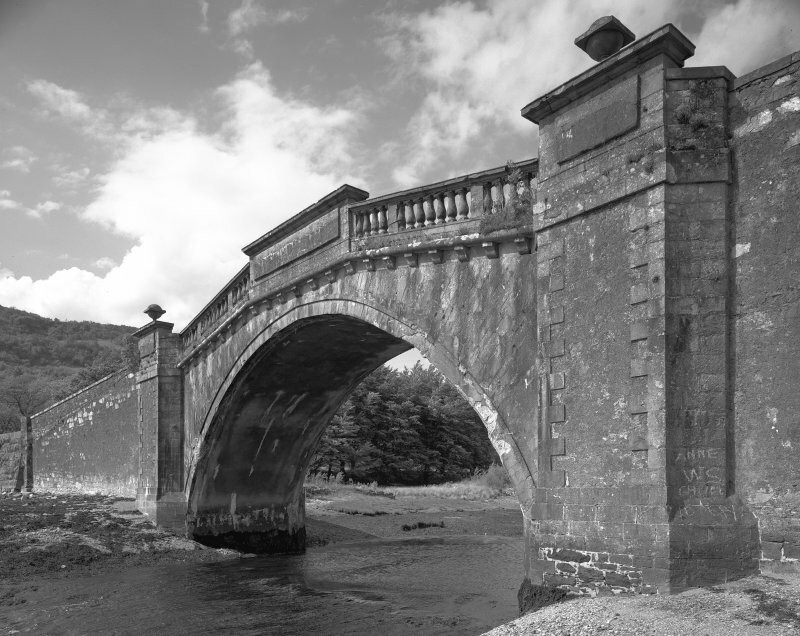 Garron Bridge by Robert Morris, Architect, 1747. W.Schomberg Scott Photograph Collection, Acc no.1997/39. This is a bridge over the Gearr Abhainn on the line of the old road. (Location cited as NN 114 101). 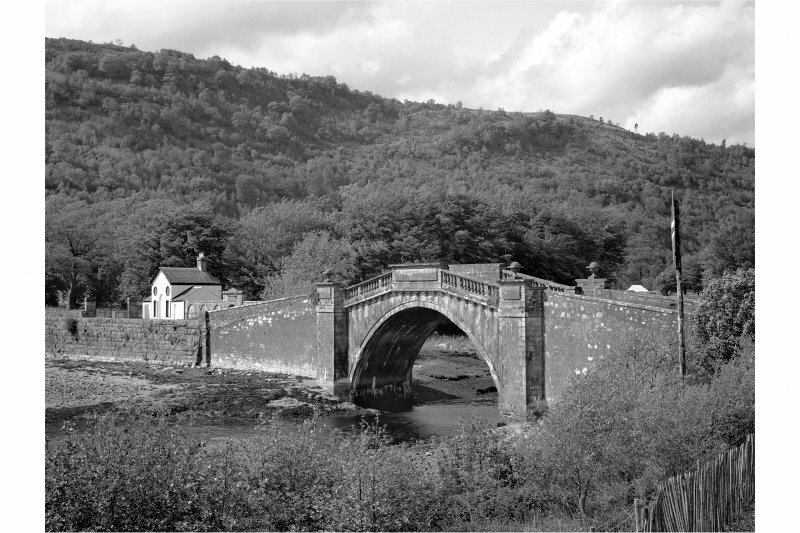 Garron Bridge, 1775, architect Robert Mylne. A large single segmental arch, with steeply humped carriageway. The parapet is balustraded, and there are terminals with ball finials. 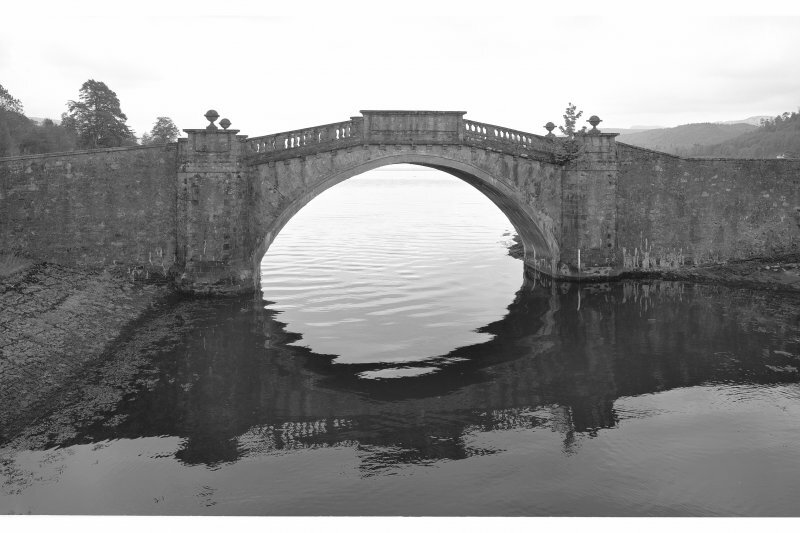 A handsome and unusually ornate bridge. Excavations [were] carried out at the request of HS to determine if the original profile of the bridge survived and to examine the extrados of the arch. Six post-1900 road surfaces and one late-Victorian road surface indicating levelling out of the bridge's profile and surviving original metalled surface in excellent condition indicating the original hump-back profile of the bridge. Sponsor: Scottish Office Roads Directorate. 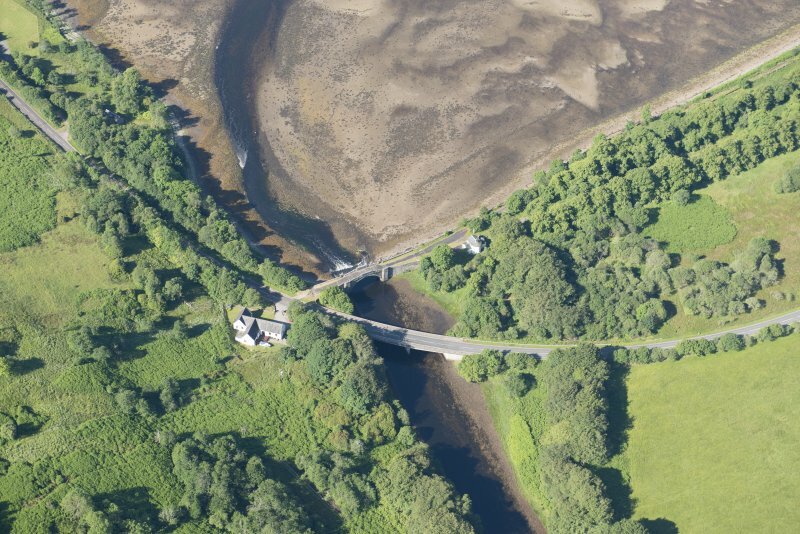 This bridges carries the former line of the A83(T) public road over the Gearr Abhainn at the upper end of Loch Shira. This road here incorporates part of the military road MR7, for which see NN11SW 14. The location assigned to this record defines the approximate midpoint of the structure. The available map evidence indicates that it extends from NN c. 11372 10109 to NN c. 11419 10084. Information from RCAHMS (RJCM), 18 May 2006. 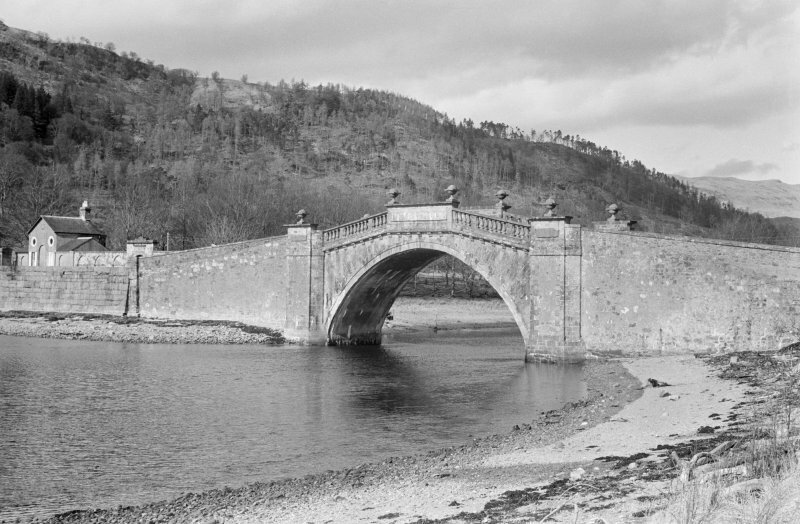 This bridge spans the mouth of the tidal Gearr Abhainn ('short river') at the head of Loch Shira, 2.3km NE of Inveraray. 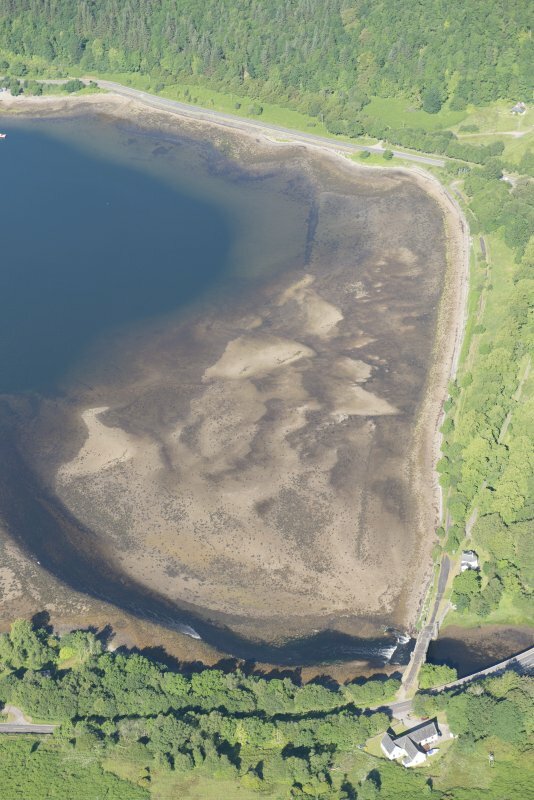 Some preliminary work was done at the site in1744, soon after the line of the military road from Dumbarton to Inveraray (No. 264) was surveyed, but detailed preparations began in 1747, when the bases of the abutment-piers were built. 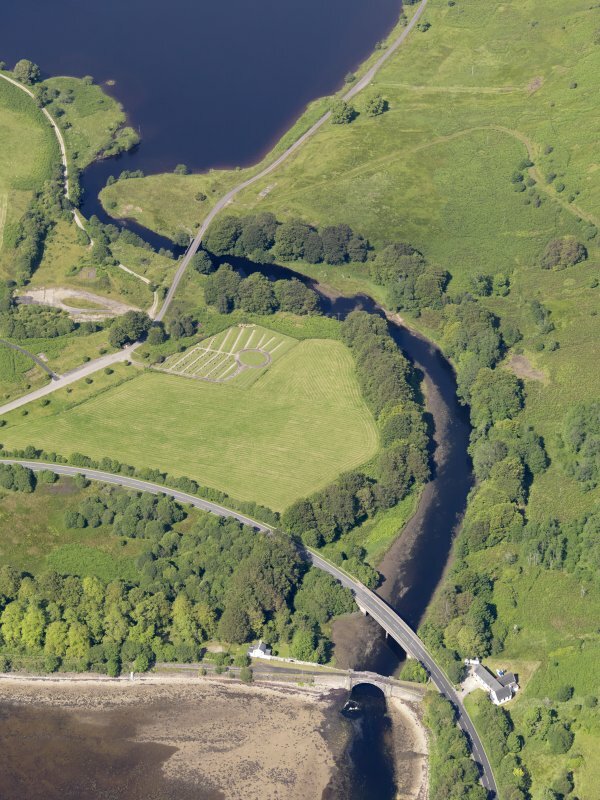 Since the river marked the boundary of the Inveraray Castle policies (No. 185) the 3rd Duke's architect Roger Morris produced the design, which was executed with the young John Adam as superintending architect, and a master-mason named Christie working under the supervision of Wiliam Caulfield, inspector of military roads. 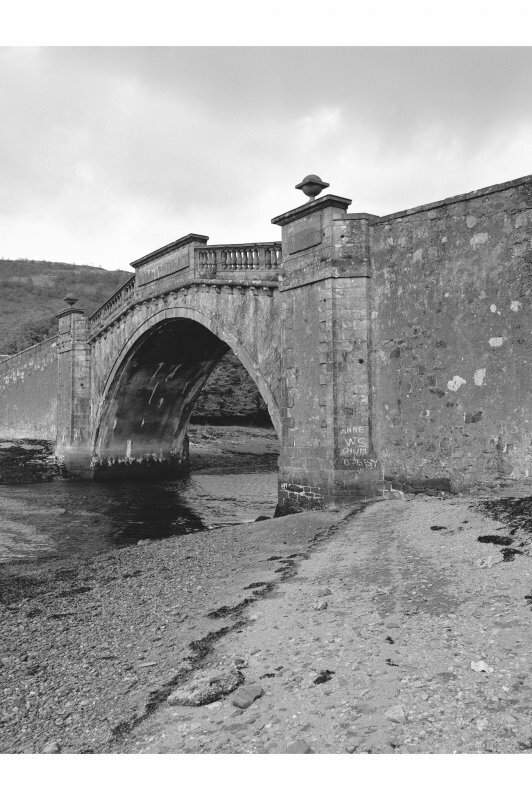 There were fierce complaints from the Duke of Cumberland in July 1749 about the cost and negligible military value of the bridge, but Caulfield was allowed to resume work in September 'as he has almost finished the bridge' and 'as a serviss to a great Man' (en.1*). 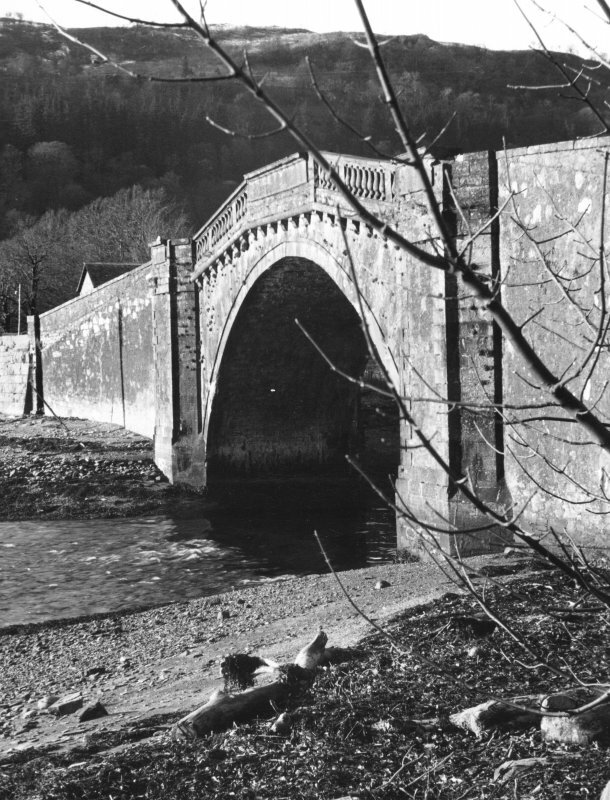 Robert Mylne surveyed the bridge for damage after floods in 1772, and in 1776-7 he prepared a design to link it by screen-walls to new lodges, of which only that to the W was built (No. 195) (en.2). 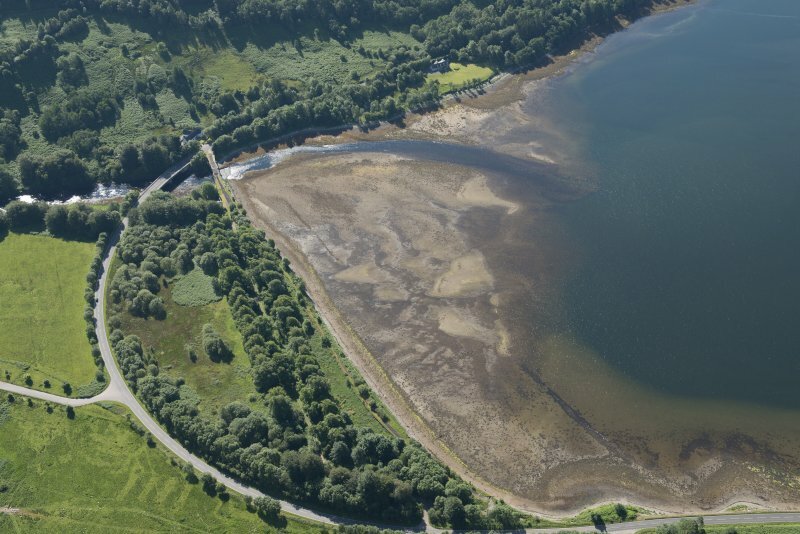 The bridge continued to carry the A83 trunk road until about 1980, when it was closed to vehicle traffic and replaced by a new bridge about l00m upstream. 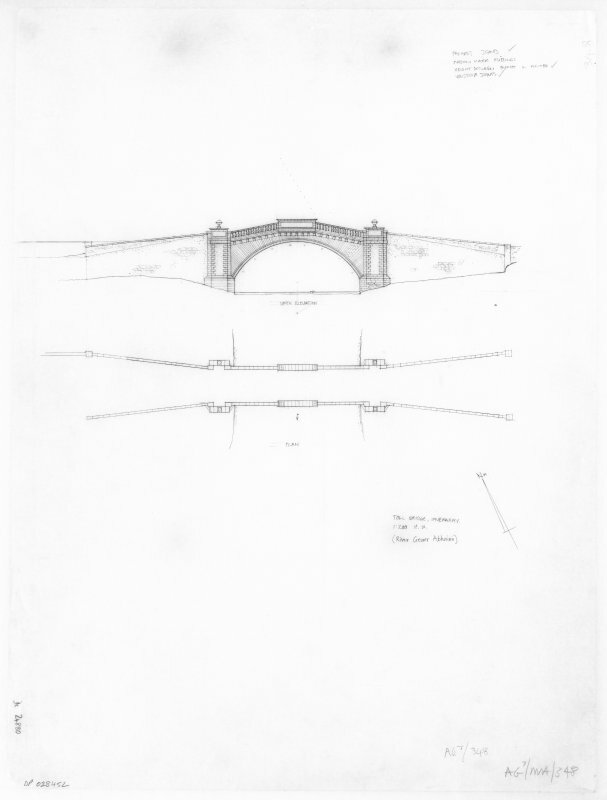 A number of drawings of the bridge survive, including two dimensioned sketches and a page of cornice- and balustrade- details by Morris himself, and Mylne's survey of 1776-7. They vary considerably, especially in the height of the superstructure above the arch and in the steepness of parapets and roadway, but with one exception all show an arch of 60 feet (18.3m), and the bridge was always so described. One drawing, however, captioned 'as approved by his Grace the Duke of Argyll' and closely related to one of the Morris sketches, shows an arch of 19.6m as built, but differs from the completed structure in the height and details of the parapet and abutments. This may have been the 'exceedingly neat and well done' design received by William Adam from Morris in February 1748, when John Adam was authorised by the architect to 'fix the proportions’ (en.3). The bridge is 28m long, with a roadway 5.1m wide, and is extended to an overall length of 66m by inclined approaches with converging revetment-walls. 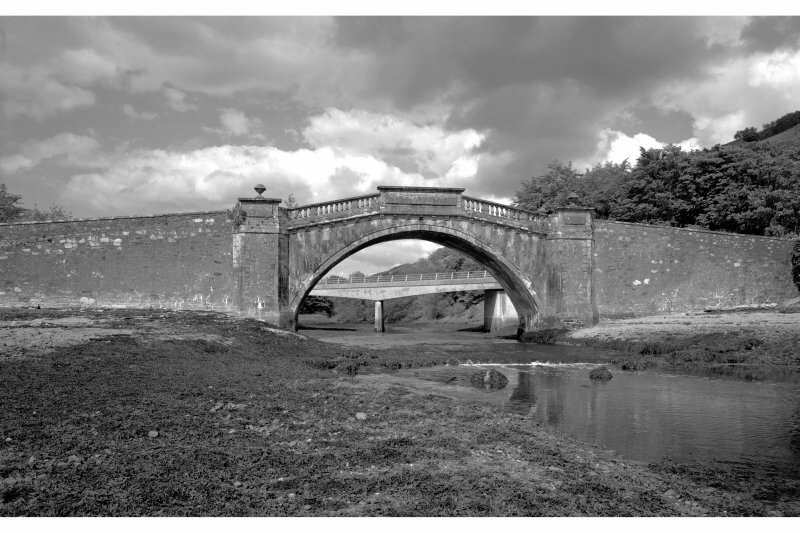 The segmental 19.6m arch has a height of about 8m above normal high-water level and5.7m above the arch-springing, and the divisions of its voussoirs are continued beyond the square hood-mould by radial courses of masonry, as shown on Morris's sketches and copied by John Adam in the Garden Bridge (No. 267). This masonry, and the copious other dressings, are of buff sandstone, with copings and finials of chlorite-schist. The bevelled rectangular abutment-piers have ashlar plinths and quoins and above broad plain bands they are surmounted by the parapets of rectangular refuges (en.4*). The parapets above the arch are carried on heavy rounded mouldings supported by ogival corbels, and comprise solid walls bearing large blank tablets on the outer faces, flanked by inclined balustrades divided by pillars in each section into groups of three, six and three sandstone balusters, with half-baluster responds of schist. 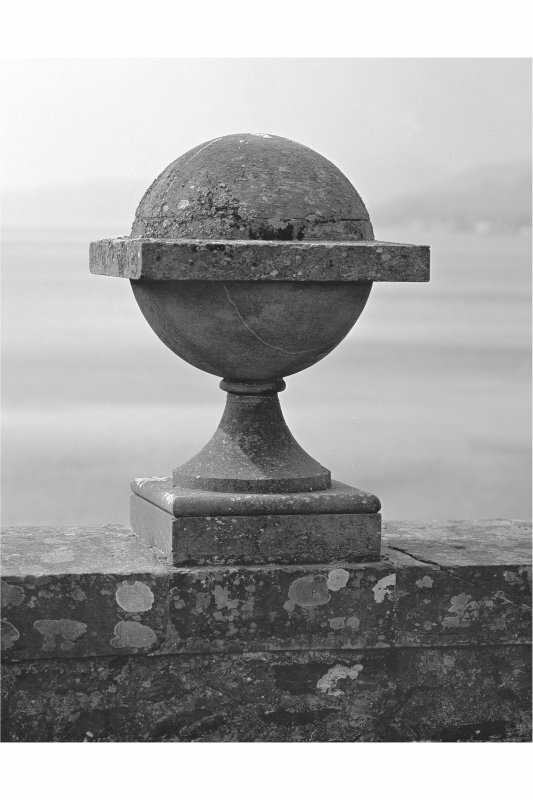 The central walls have heavy cornices, each of which until recently carried at each end a ball-finial 0.84m in diameter, 'intersected' by a thin square horizontal slab. The solid abutment parapets have similar cornices above blank tablets, and retain their single finials. 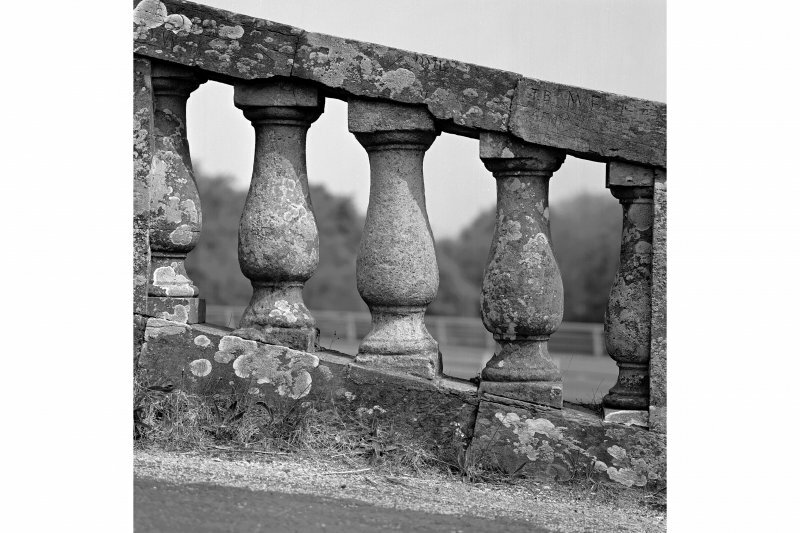 There are numerous graffiti on the parapet-copings, including yachts of 19th century character, and a group of masons' marks on the upper pillar of the SE balustrade. The revetment-walls of the inclined approaches are rubble built, with plain slab copings of schist, and end in ashlar piers. Both sides have been heightened, by as much as 1.6mat the outer ends, and the steeper original line corresponds with that of early drawings, including Mylne's elevation of 1776-7. On the N side, the lower part of the parapet of the W approach was heightened by Mylne to match the adjacent screen-wall (see No. 195). 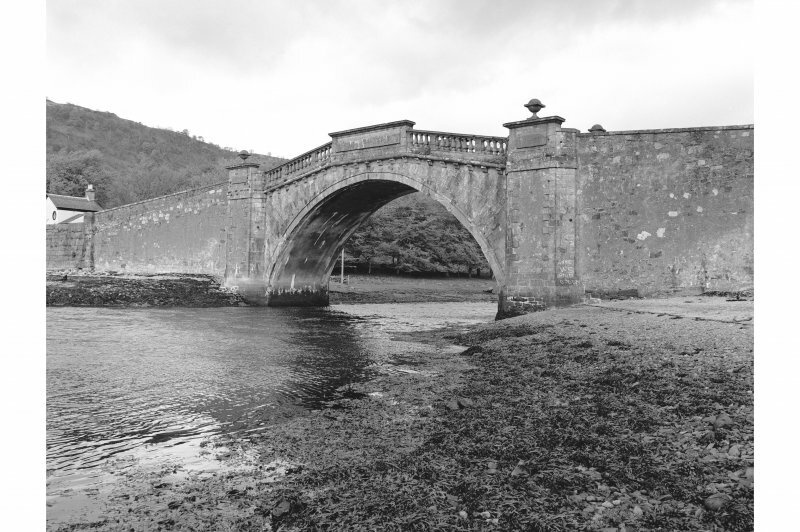 A handsome single-span segmental arch bridge of about 40 ft span over the Garron about 2 miles north-east of Inveraray. It was designed for the Board of Ordnance by Roger Morris, overseer John Adam, and built in 1748. It is strongly ornamented, with masonry baluster parapets leading to solid work at the crown, pronounced shaped abutments on the elevations surmounted by masonry globes and a denticulate string course. The bridge has been bypassed on its north side by a modern road bridge which affords a good view of its predecessor. subsequent modifications. 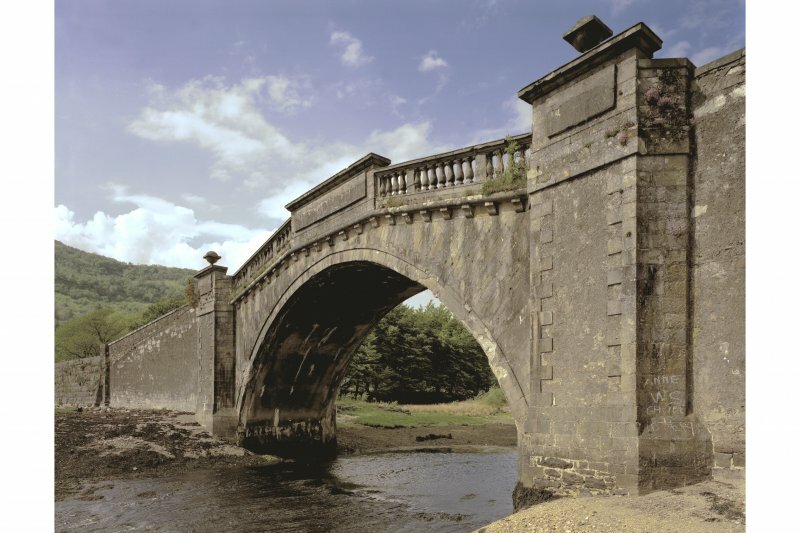 A programme of works was carried out, August 2008–March 2009, in conjunction with a conservation architect’s appraisal in order to inform the future conservation and repair of the bridge. Works involved general survey drawings, a detailed record of the parapets and an analysis of its evolution. The 18th-century structure was successively raised between the late 19th and mid 20th centuries, works to the fabric, particularly the parapets, being closely related to the series of road raisings recorded by evaluation in 1993. 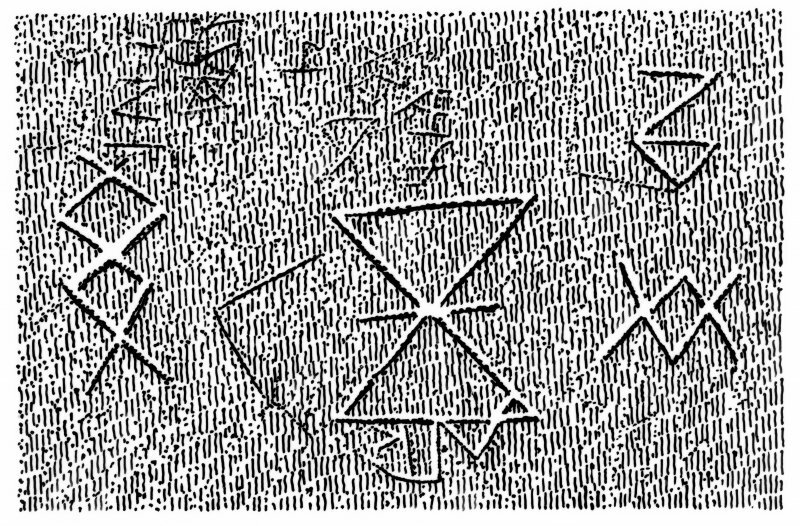 Much historic graffiti was recorded including many names of 18th- and 19th-century date, but more unusually at least four ship carvings were identified, two possibly of the Loch Fyne skiff type, the third a very obscured two- or three-masted vessel, and the fourth a stylised representation only (Alan Braby, pers comm); multiple masons’ marks were also recorded.